Last week Olympic ski sensation Lindsey Vonn revealed that she suffers from depression, which for us, just underscores the fact that it can really happen to anyone. Just 28, she says she's quietly suffered from depression for years. At one point in 2008, she felt like she couldn't even get out of bed, and told People, "I felt hopeless, empty, like a zombie." Last week Olympic ski sensation Lindsey Vonn revealed that she suffers from depression, which for us, just underscores the fact that it can really happen to anyone. Even celebrities and Olympic athletes aren't immune to that crippling mental state, and you certainly can't tell by looking at someone (or their life) how they feel inside. So we're glad to hear that the gold-medal winner is doing better and feeling happier than she has in the past. Just 28, she says she's quietly suffered from depression for years. At one point in 2008, she felt like she couldn't even get out of bed, and told People, "I felt hopeless, empty, like a zombie." "Depression doesn't select by age or race or socioeconomic status or gender (although it is more common in women)," says Simon A. Rego, PsyD, director of psychology training at Montefiore Medical Center in New York City. "It's a bona fide medical illness." Being depressed is not a sign of weakness. People who are depressed should seek help. Vonn is currently taking antidepressants to help manage her symptoms and is back on track with her life after filing for a divorce last last year. Thirty years of research now suggest that therapy, and specifically cognitive behavioral therapy (CBT), can really help many people with depression. CBT focuses on a person's thought patterns and behaviors, ways to change them to break out of depression. "It's now considered one of the treatments of choice for major depression," says Rego. Vonn is not alone in the need for medication to overcome depression. Some 11% of Americans aged 12 and over take an antidepressant medication. Some studies suggest that medications combined with CBT can be more effective than either one alone, especially in more severe cases, says Rego. A hallmark of depression is the tendency to become withdrawn and isolate yourself but those factors can make the depression worse. "Your gut may tell you nobody cares or don't answer that phone but this is one time you should act against your gut," says Rego. "Take advantage of social networks, family members, push yourself to be with them. You get a lot of resiliency through social relationships." The first step towards getting help is knowing that you have a problem. There are nine symptoms associated with major depression and sadness is just one of them, says Rego. Others include loss of interest or pleasure in normal activities, poor concentration, restlessness, insomnia, and loss of appetite. What's more, women and men with depression may tend to exhibit symptoms in slightly different ways. If you think you might be depressed, see a doctor. 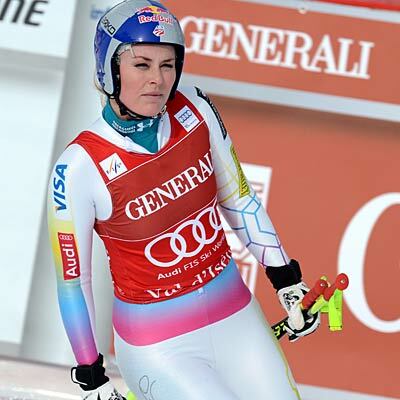 Vonn recently took a break from the World Cup ski season in St. Moritz, Switzerland to recover from intestinal problems, but seems to be moving away from depression. "All the parts of my life are finally in sync," she told People. "I accept who I am, and I'm moving forward."